Busy week? We get it. Here are some highlights from the cover to get you caught up. 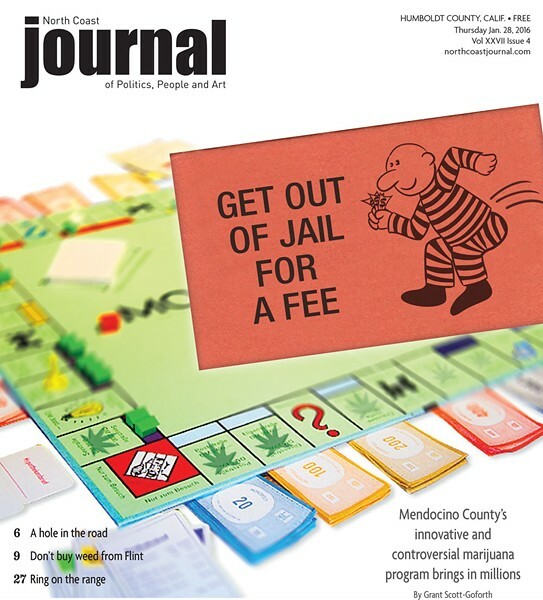 Not long after he was elected as Mendocino County’s district attorney in 2011, David Eyster instigated an innovative — and lucrative — new program. County residents charged with certain marijuana felonies — usually possession with intent to sell — could pay the county a restitution fee that Eyster would calculate on a per-case basis. In exchange, their felony charge would be reduced to a misdemeanor and they would avoid jail time and get a grant of probation instead. Not surprisingly, the program has supporters and detractors. 1. The program has brought in nearly $3.8 million to the county’s general fund since it began in 2012, including $2.05 million last year. Marijuana cases take half the time to prosecute, and keeping people out of prison saves taxpayers untold amounts. 2. One Mendocino County judge has called the program “extortion,” and critics say it could be unfair to indigent defendants. Eyster counters this by saying that, because he handles each case, he can fairly assess a restitution amount based on the defendant’s role and general wealth. 3. The program is popular — if that’s the right word — with defendants: 429 cases have been resolved with restitution (and they’ve paid an average of $9,000 each). Only five people offered restitution plea deals have declined in favor of a trial. Even an attorney suing the county to stop the program said two former clients “wisely” chose restitution over trail. 4. Eyster translated the program’s success into a raise for himself and county Sheriff Tom Allman, convincing supervisors last year that he was being underpaid for his role. His salary jumped 16 percent to $140,000 this year — meanwhile, most other county employees received a 5 percent raise. 5. The program won’t be coming to Humboldt anytime soon. DA Maggie Fleming says, with new state and local marijuana reforms taking effect and potential recreational legalization on the ballot in November, it doesn’t make sense to start a new program for marijuana cases. Read the cover in its entirety — and add your comments — at this link.